GeekTonic: Win a Firefly Remote Control - Firefly Giveaway! Win a Firefly Remote Control - Firefly Giveaway! Dave Zatz and I are giving away a Firefly PC Remote ($50), courtesy of Snapstream. 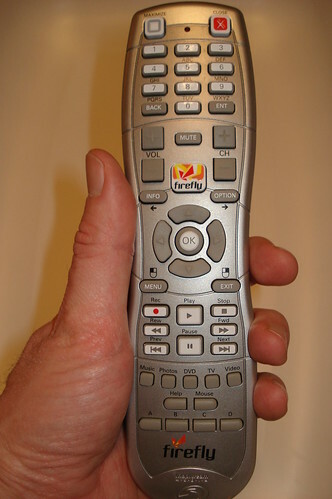 For remote details, check out my review of the Firefly Home Theater PC Remote Control or Dave Zatz hands-on. UPDATE: DAVE HAS CHOSEN THE WINNER WEDNESDAY, MAY 13TH AT 5PM AND ANNOUNCED BRUCE AS THE WINNER IN THE COMMENTS OF THE POST. THANKS TO ALL WHO PARTICIPATED! Leave a comment on the ZNF post saying you want in. Be sure your comment is accompanied by a Gravatar image/icon - sign up here. (It’s painless, really.) Please be located in the lower 48 (US) and we’ll randomly choose a winner later this week. Remember - to win, your comment must be on the ZNF post so click on the following link to leave your comment an win! SageTV HD100 Extenders are Back!